When two of our favorites team up, it makes for a very special release, and that's what we have for you today. FZB favorite Anda Volley has just released Paper Moon, her new EP and part of FZB favorite Silber Records' 5in5 series. Volley has always made stunning and wide ranging indie music. Now, with the challenge of 5 one minute songs, we hear her rise to this challenge with originality and depth. Her EP is dark, experimental and hearkens back to influences from new wave to goth. This EP is a must have. Anda Volley, a Boston based songwriter, joins Silber records and has to do their initiation ceremony, the 5in5 series. The artist has to do five songs in five minutes. Which sounds really difficult, and while Volley goes over the remit by a good thirty seconds, we won’t hold that against her. It’s hard to get into this, as everything is over pretty much as its starting, but the five tracks here are fuzzy electronic vignettes, bursts of odd sounds that hint at more. One imagines that’s the entire point of the 5in5. As a calling card, it’s intriguing, it draws you in. As a review, it’s frustrating. Like scoring a restaurant based merely on their breadsticks. In the meantime, Volley has a back catalogue, so check that out. Impossible to pin down, Anda Volley’s “Paper Moon” is tribalistic lo-fi with a hint of noise. Quite gorgeously delivered the songs interact to create a ceremonial quality to it. From the environment small sounds skitter about with a sense of purpose. Vocals rest at the heart and center of the songs as they swirl about with great purpose. Lyrics add to this mystical sense as the way they unfurl reveals a curiosity about the rest of the world, of its magic and wonder. The collection opens up with the strong beating presence of the title track “Paper Moon”. Sung with great passion the song has a seductive quality to it as the vocals soar into the sky. Industrial grooves adorn the harsh edges of “Wolf Meet”. Layer upon layer of sound comes together to set the mood for something quite ominous. By far the most compelling moment of the collection rests within the mantra of “The Life Inside You”. Within this singular piece a phrase finds itself totally and completely distorted almost beyond recognition via glitch effects with various noises added in for good measure. Following this is the lovely work of “Where I Feel Most at Peace” where the song builds itself up into a glorious swirl. A haunting choir ends the album off on an eerie note with “Crane and Chrysanthemum”. 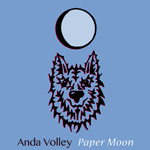 Quite beautiful in its approach Anda Volley creates surreal soundscapes on the oddly catchy “Paper Moon”. It is time for the latest release from Silber Records’ 5in5 project (5 tracks in 5 minutes). This time round it comes from Boston’s goth/rock/pop/industrial artist Anda Volley. In past reviews I’ve mentioned a shopping list worth of sounds and elements that Ms Volley has adopted and made into her own, and while this release is but 5 minutes long, it manages to pack in all these elements once again and make them all work. According to the liner notes, on this EP Anda Volley takes you into her world of broken dolls trapped in an attic. There certanly is a feeling of brokeness and being trapped expressed over the couse of the 5 tracks, with all manner of scary sounds explored along the way. The title track is a slow atmospheric tune. The slow drumming and industrial sounds makes you feel like you are out in an abandoned field during the night of a full moon. Anda’s deep powerful vocals further amplify the dark vibes. ‘Wolf meet’ is a slow droney instumental tune. The slow tones bringing out an unnerving industrial soundscape. ‘The life inside you’ is a spoky spacey tune that sounds like the soundtrack to a David Lynch movie that involes alien invasions. ‘Where I feel most at peace’ continues the spooky spacey vibe, with the slow deep echoing vocals adding to the creepy and confronting feel. ‘Crane and Chrysanthemum’ sees the spacey, thriller atmosphere hit its peak. With strange sounds filling the space it sounds like a mass of strange alien creatres are swooping in to attack with the intensity getting bigger and bigger as the song goes on. This is an utterly amazing piece of work. Anda Volley has packed in a thick spacey atmosphere full of thrilling and confronting sounds. In just 5 minutes Anda Volley has packed in more action than many artists can must across a whole album! Silber Records has an ongoing EP series called "5-in-5," which means that you get 5-track/5-minute albums. Anda Volley's Paper Moon is one such release and I do think it suffers a little bit from the time constraint, simply because some of its contents do consequently sound unfinished. That being said, Volley's electrically dark musings find some interesting commonalities with Jarboe or Insect Ark. I especially like the unsettling motion of "Wolf Meet."